Michael Gizinski of Wood River won $22,000 playing 2by2 from the Nebraska Lottery. Gizinski purchased his winning ticket from Casey’s General Store at 108 W 8th Street in Wood River. The ticket contained the winning Red ball numbers (05, 19) and White ball numbers (08, 21) from the July 29 drawing. 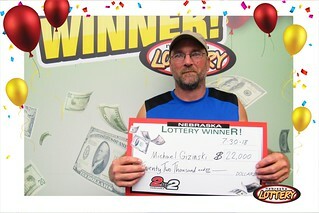 Gizinski came into the Nebraska Lottery offices to claim his winnings on July 30and said thanks to a coupon, his first time playing 2by2 netted him the jackpot. Usually a Powerball or Mega Millions player, he took a chance and bought seven days’ worth of 2by2 Lotto tickets for $5. “I honestly didn’t believe it,” Gizinski said. He was on his way home from work when he heard a radio announcer say there was a winner in Wood River. Rain was pouring down, so he pulled over and checked his numbers on his phone. The numbers matched and he headed to the Nebraska Lottery office in Lincoln to claim the prize. Gizinski said he’ll be using the $22,000 to pay off some bills. “I still don’t believe it,” he said as he left with his check.